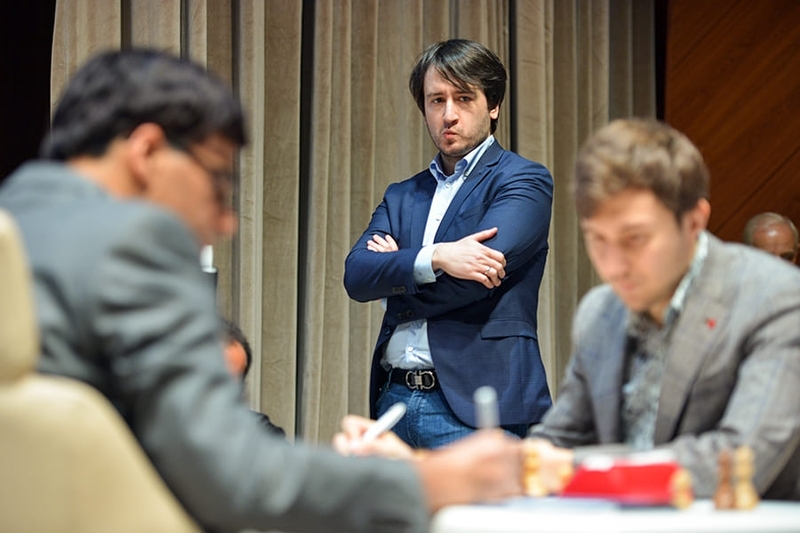 Sergey Karjakin blitzed out 37 moves of preparation then outplayed Vishy Anand in an endgame to catch Magnus Carlsen in the Shamkir Chess lead with three rounds to go. No less than six players are a point behind the leaders on 50%, including Veselin Topalov, who pounced on a blunder by the out of form Shakhriyar Mamedyarov. Magnus Carlsen admitted he was “just trying to stay afloat” against Ding Liren after an opening gone wrong, but he found a “very, very ugly” but sufficient solution to his problems. 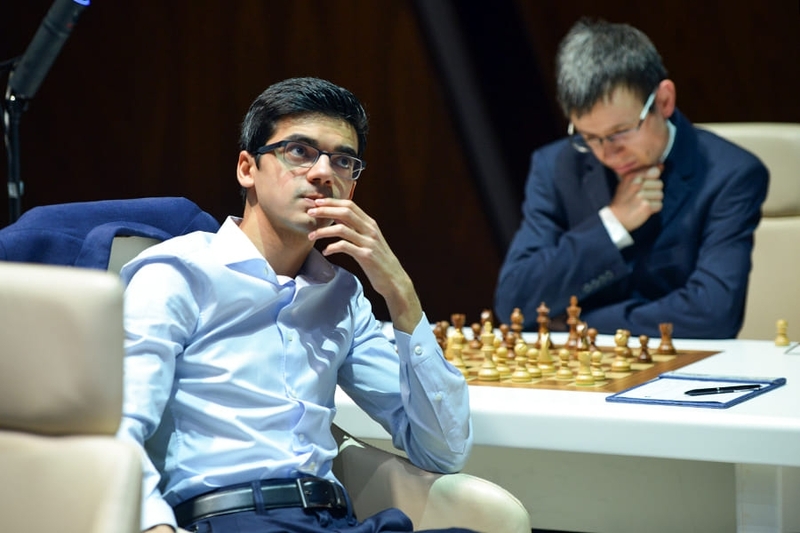 Vishy Anand must by now be wishing he hadn’t chosen to champion the 10…Rd8 Queen’s Gambit Declined line that Fabiano Caruana used to surprise Magnus Carlsen in Game 2 of their London match. When Vishy played it in Round 2 against Magnus himself the World Champion decided to repeat the cautious 11.Be2 and went on to win what both players agreed should have been an equal ending. In Round 6 Sergey Karjakin instead played the principled 11.Nd2 that Levon Aronian had tried in a rapid game against Caruana in the London Chess Classic after the match. Probably Vishy underestimated that White can still play here and the game is not over. 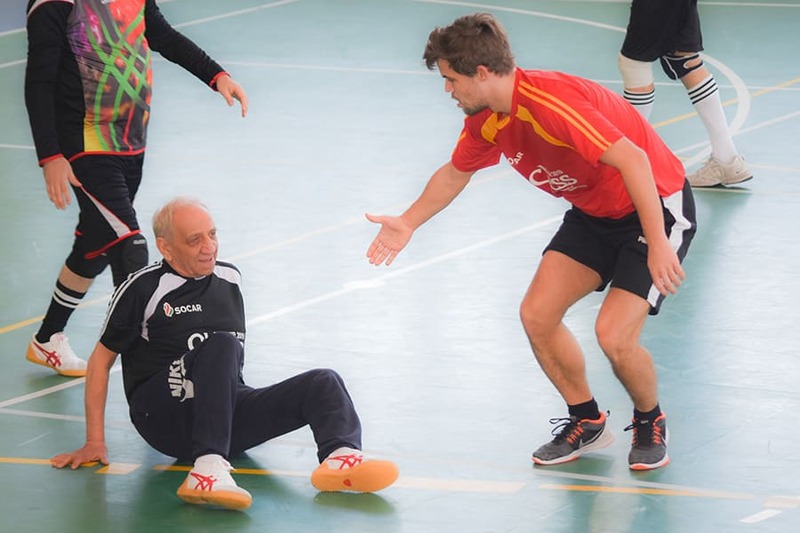 It’s not dead lost, but basically it should be lost… I expected him to play some more moves. It was a big win for Karjakin, since he’d been tied with Anand for second place before the round and had now caught Carlsen in the lead. He has an excellent chance to fight for tournament victory since he plays David Navara in the next round and then has White against Magnus in Round 8. Topalov 1-0 Mamedyarov: Where is Shak? 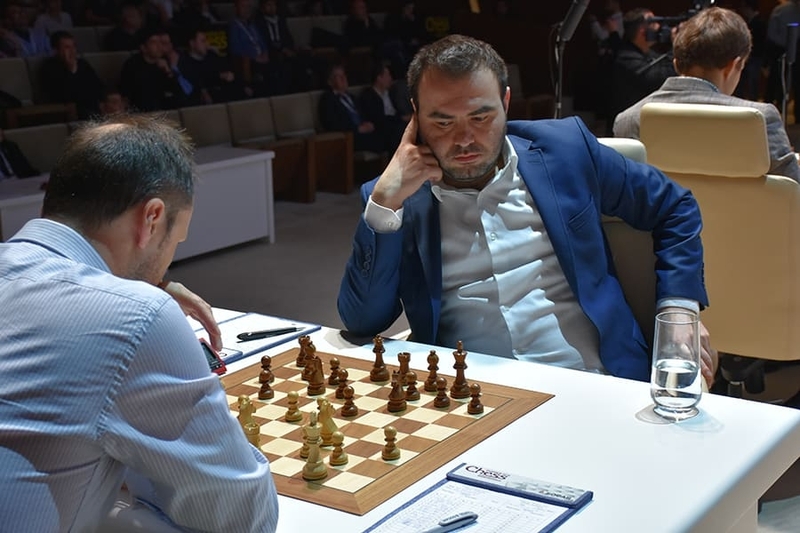 After a couple of years when Shakhriyar Mamedyarov performed as a stable 2800+ player, he’s had a miserable start to 2019. In 13 games in Wijk aan Zee he didn’t win once and lost twice, and now in six games in Shamkir he’s also lost twice without a win. His only classical victory of the year so far was against Sam Shankland in the Bundesliga. Shak had seen that 30.Rac1? runs into 30…Rc4!, and White has to give up his queen (31.Qe2? of course fails to 31…Rxc1), but missed that after 30…Rdc1!, as played in the game, 30…Rc4 is now met by 31.Qd1!, an option White didn’t have with the rook still on the d1-square. Such tactical nuances are of course easy to miss, but Mamedyarov had over an hour on his clock when he played the losing move. 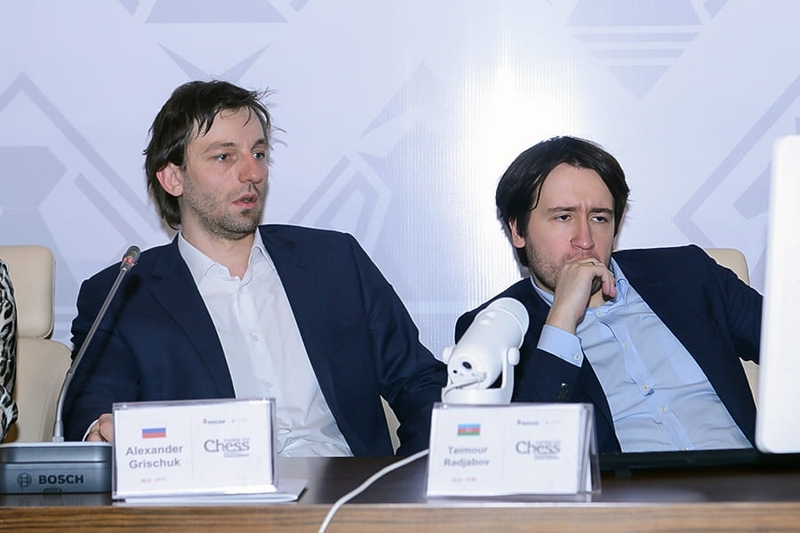 For Topalov it was a bounce-back win immediately after the loss to Alexander Grischuk before the rest day and put him back on 50%, with five more players. 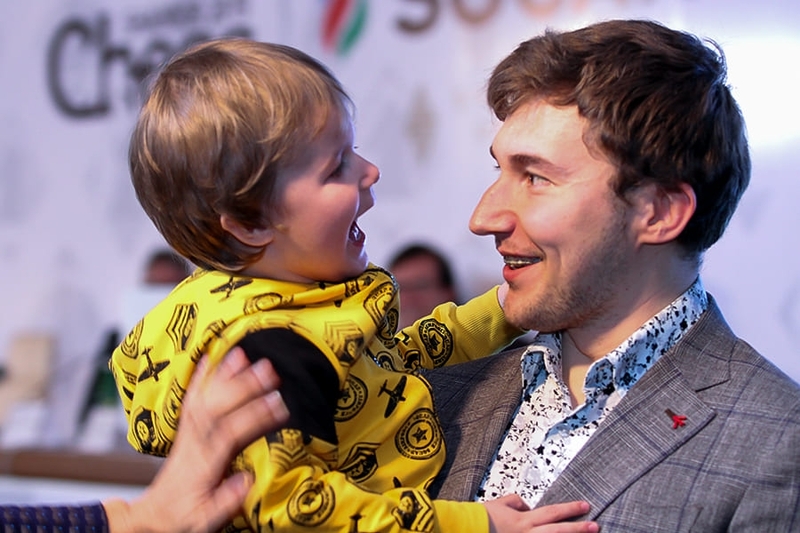 Mamedyarov, the winner of two editions of Shamkir Chess and world no. 5, is in joint last place, with Anish Giri, the world no. 4! Computers suggest he could, while after 12.Ne5 Qb6 Black was already more than fine until the game ended by repetition on move 26. 20…h5! with g5 and g4 swiftly following. The game looked like a thriller, with both players down to their last five minutes with 10 moves to go, but suddenly it fizzled out into a series of exchanges and a repetition that ended the game on exactly move 40. I got a kind of a tough position right from the opening. I don’t know what went wrong, but it became a bit unpleasant… I think the danger about these symmetrical positions is that the extra tempo can sometimes be a huge factor, and it’s also often seen in the Exchange Slav - either it’s a clear draw or, if Black cannot force the draw, it’s usually a bit unpleasant. If you get control of the only extra file you’re doing well. The f4-bishop covers the b8-square, and the a7-pawn is in imminent danger. If Black had to resort to passive defence such as 25…Ra8 Magnus could see no equality, but he found a better option (one he prepared with 23…Re8! ): 25…e5! I was just trying to stay afloat and I was happy to find this move Re8 finally. Obviously it’s very, very ugly, just going for a rook ending a pawn down, but I couldn’t really see what he could do at that point, and anyway otherwise I don’t think I could equalise. Ding Liren agreed that the rook ending after 26.dxe5 Bxe5 27.Bxe5 Rxe5 was no more than a draw, so instead he went for 27.Rd3 Bxf4 28.gxf4, but if there were more practical chances there Magnus was the last person you could hope to convert them against, and the game ended in a 39-move draw. Round 7 can be a big one, with Navara-Karjakin and Carlsen-Giri both games were the leaders are likely to look to win. Magnus will be hoping this is one game in which Black doesn’t go first... Tune in to all the action from 13:00 CET live here on chess24!